A new Dallas museum will show an exhibit with a Holocaust survivor the likes of which you’ve never seen. Or talked to. After the Holocaust, that mid-20th-century horror of human destruction, many survivors were reluctant to talk about their experiences. For some, what they had gone through was too traumatic to put into words. They tucked their memories away as far as possible, in the backs of their minds. But those memories did not go away. They kept intruding. And, too, many people feared disbelief. Who could ever imagine such inhumanity, such suffering? Max Glauben is different. He is among the survivors who organized to found Dallas’ first Holocaust Center, in 1984, in the lower level of the Jewish Community Center of Dallas on Northaven Road. Since that time, the 91-year-old has often spoken to groups of adults and students, sharing his personal history. And every spring for the last 13 years, he has accompanied a group of local teenagers on the March of the Living, an educational program bringing together young Jews from around the world. Together, they see the ovens at Auschwitz and Birkenau, then proceed to Israel, to celebrate the anniversary of the Jewish state’s founding on May 14, 1948. 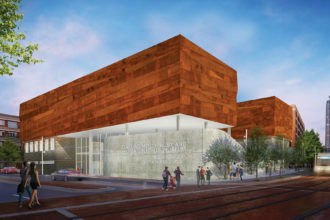 Memory Serves: Started in a small space in the basement of the Jewish Community Center in 1984, the re-christened Dallas Holocaust and Human Rights Museum has grown large enough to fill a new, 55,000-square-foot facility in the West End, with a 250-seat Cinemark XD theater and room for 200,000 annual visitors. It will be dedicated on September 17. Now my old friend is about to become one of the few people on the planet whose likeness and life story will be preserved for eternity in a 3-D holographic moving image, which future generations can talk to. They’ll be able to do this at a transformative museum that will open later this year in the West End Historic District downtown. I got a sense of what holographic Max will look like while visiting another museum just across the street from NorthPark Center. In November 2017, I met a man named Pinchas Gutter at the Museum of Biblical Art. He was seated on an armchair and appeared fully alive. I stood facing him, and in front of me, on a wooden lectern, was a mouselike device connecting me with this holographic Pinchas. I could press the button and ask him questions, and he would answer them. So I did. And so he did! Pinchas was born in Lodz, Poland, and now lives in Toronto, Canada, a country that offered shelter to some 40,000 Holocaust survivors after their liberation. Most of them are long gone now. Pinchas is in his mid-80s and white-haired. I pressed the button and asked my questions; he answered, promptly and fully, with normal movements of arms, hands, legs, feet. The Museum of Biblical Art was the first place in Dallas to give people the opportunity to experience this immersive history. We can thank Steven Spielberg. Spielberg has directed more than 100 films, but he made perhaps his biggest mark on the world with 1993’s Schindler’s List. The following year, it led to the founding of a major Holocaust-related institution, the USC Shoah Foundation. The organization documented the stories of thousands of survivors and witnesses to wartime events from 65 countries, recording them in 43 languages. Along with Jewish Holocaust victims were people from other groups who had been confined and tortured by the Nazi regime: homosexuals, Jehovah’s Witnesses, Roma, political prisoners. Also included were those who had rescued or provided aid to the persecuted. Additional testimony was obtained from people who had taken part in the war crimes trials held in Nuremberg, Germany, in 1945 and 1946. The word shoah is Hebrew for a major calamity or catastrophe, but it’s now used in Israel to designate specifically what we in the West have come to call the Holocaust. That word’s meaning in its original Greek is “sacrifice by fire,” which entered our vocabulary after the discovery that Hitler’s Nazis had committed wholesale murder of Jews by mass gassing, then burned their bodies in specially constructed crematoriums. The USC Shoah Foundation aims to educate people about that atrocity and other worldwide genocides as well. As it stands today, the foundation’s original Visual History Archive is a trove of some 55,000 video testimonies. And now the foundation is providing support for the Holocaust survivor program at USC that is bringing holographic Max to Dallas. Called “Dimensions in Testimony Interactive Experience From USC Shoah Foundation,” the program aims to save as much face-to-face interaction as it can, not just words and photos. Maio Smith has compiled the questions and asked them herself of 18 of the first 19 subjects who’ve participated in the project; for the lone other, a Chinese woman who was a victim of the 1937 Nanjing Massacre, Maio Smith had the assistance of a Mandarin-speaking interpreter. Max, like several others, was filmed and will be exhibited on his home turf. The production crew did not come to Dallas, as someone humorously suggested, because Holocaust survivors sleep better in their own beds at night. That may indeed be true, but the gear has evolved along with the project and is now portable. Earlier interviewees had to be uncomfortably sequestered in a “bubble” enclosure that could not be moved from the original filming studio in Los Angeles. Max Glauben was born in Warsaw, Poland, 91 years ago. For the creation of his holographic installation, he was filmed in late August 2018 in the MPS Studios on Regal Row, in Dallas. I was present on the first day, and watched the first two recording sessions. I chose to view the initial one head-on, so that I could see Max directly, and the second from the side, to watch the interviewer, Maio Smith, in the process of questioning him. Against a green background, Max—dressed in a white shirt, light khaki pants, brown sneakers—was seated in a gray upholstered armchair. At the start, he seemed uncomfortable, almost frozen. But slowly he began to move his arms off the chair’s armrests, using his hands as he talked. Then, rather suddenly, his legs were splayed outward instead of held stiffly together in front of him. I could see the crew of nine filming and could simultaneously watch Max on 18 screens, so small they resembled large playing cards, that were capturing him from every angle. Filming is done from nine angles by 18 cameras. Placement of the subject facing the viewer’s camera provides the holographic image’s simulation of natural eye contact between speaker and listener. Recording sessions of up to 90 minutes each total 20 hours of interviews and filming over four or five days. 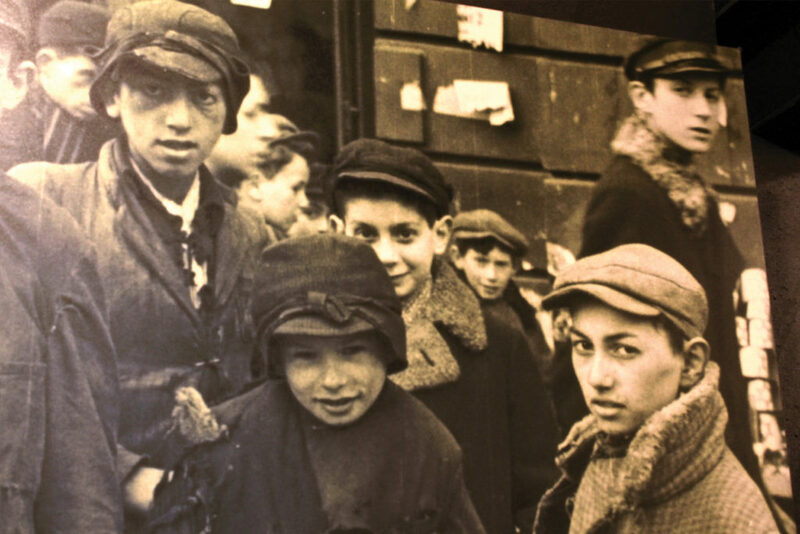 About a Boy: Glauben (third from left) lived in a Warsaw ghetto for three years, beginning when he was 12 years old. He had never shared with anyone some of his experiences from that time until he was interviewed for USC’s “Dimensions in Testimony” program. Without hearing Maio Smith’s questions or Max’s responses, I could only imagine what the future holographic Max would tell me. Soon his gestures grew bigger; he waved first his left arm, then his right, with all his fingers spread wide. Every so often he raised his voice. I could almost hear him. Then it was over. It had been two hours, and he had only begun to tell his life’s long story. Max was a child in the Warsaw ghetto from age 12 for three years, then a prisoner in five concentration camps for two years. The tattooed letters KL, marking him for death, remain on his wrist to this day. The last camp was Flossenbürg. When the Germans knew that their time was ending, they ordered all prisoners on a death march to the infamous Dachau. Max, then 17, again survived, to be liberated there by the tank division of Gen. George S. Patton’s Third Army. During a break in the filming process, Max hovered protectively near his wife, Frieda, a native Dallasite. The two met and married well after his American arrival in 1947, following five years of service in the U.S. Army. They now have three children, seven grandchildren, and one great-grandchild, and are anticipating the birth of a second great-grandchild. Max can hardly believe that someday, even after he’s gone, this child will be able to see and hear him talk about his early life experiences—some of which, he admits, he had never shared with anyone before this special recording. Through it all, Max never lost his faith. “Religion is in your heart,” he says. “You feel somebody is always watching you.” He quotes Alan Simpson’s eulogy for the late President George H.W. Bush: “Hatred corrodes the container it’s carried in.” And then he quotes himself: “Hate grows in the hater like yeast in dough about to be baked.” To counteract this, he volunteers to tell his story, over and over and over. In 1977, a group of Dallasites, survivors and others, formed the organization that eventually led to the 1984 opening of the city’s first place dedicated to remembering the Holocaust. Its main purpose then was to honor the many who had not survived, so it was called the Dallas Memorial Center for Holocaust Studies. But that small space in the Jewish Community Center of Dallas’ basement was inconvenient, and limited parking for its growing number of visitors helped prompt the 2005 move to a larger rented space on Record Street, in the city’s downtown. With that move came an expanded mission and a new name to reflect it: the Dallas Holocaust Museum/Center for Education and Tolerance. But this place has also proved too small. Holocaust history has become a topic for study in many schools, which has greatly increased the number of classroom groups wanting to visit. The space limits activities and hinders effectiveness. At present, there is room for a core exhibit that permanently tells the story of one single day during the Holocaust; facilities for only one traveling exhibit at a time; and a single room, set with chairs, that limits the size of audiences for lectures and films. All this made it clear that another move was necessary. Ground was broken and construction started on a new and much larger facility in October 2017. The dedication date has been set for September 17 of this year. And again a new name will accompany the move to these greatly enlarged permanent quarters, 55,000 square feet, on nearby Houston Street. 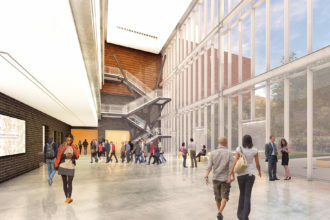 The Dallas Holocaust and Human Rights Museum will accommodate some 200,000 visitors annually, more than double the number on Record Street and more than half of them students. With new interactive features, including a 250-seat Cinemark XD theater, it will continue to expand its efforts to encompass the present as well as the past. With Max, forever, we look forward to a better world to come.